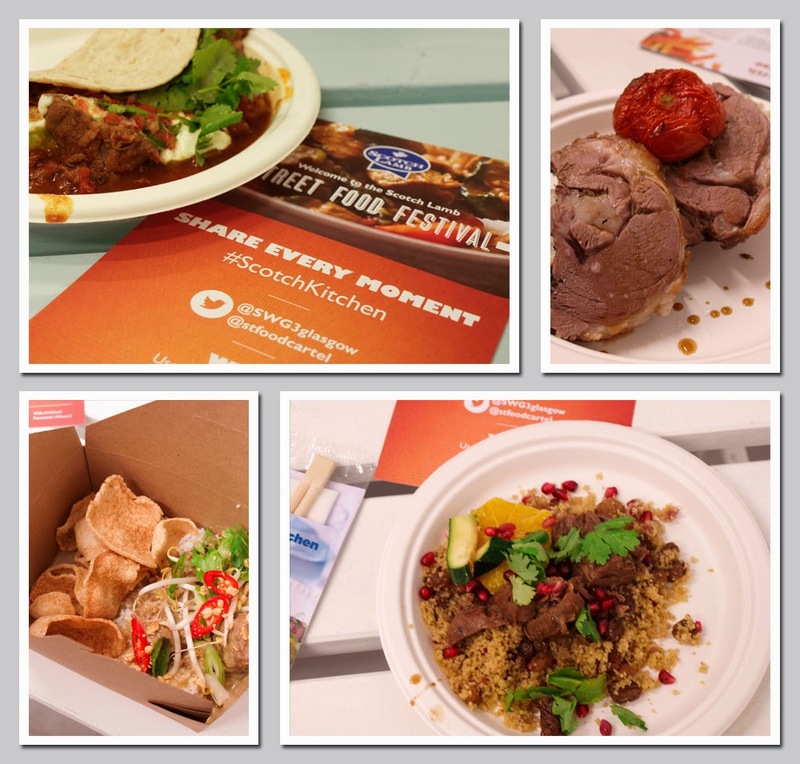 We all enjoy a Sunday roast, but it was so much fun to try some more adventurous dishes made with lamb at the Scotch Lamb Street Food Festival. The Street Food Festival was tucked away in a venue in the West End of Glasgow, an area which I thought I knew quite well, but this was a place I had never been to, it was all a little bit mysterious The Studio Warehouse is right at the end of a lane, next to a fast main road, the Clydeside Expressway, and beside some old fashioned arches. However it was an ideal space for an indoor Street Festival, and it was just as well it was indoors as it was pouring with rain when we arrived just after 11am. 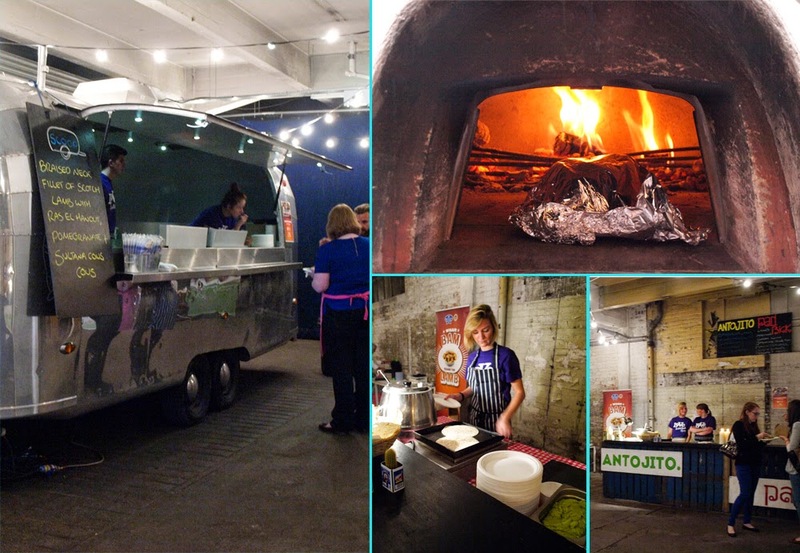 The food for the Street Festival was provided by The Street Food Cartel who served up a specially created menu from four of their most popular street kitchen stalls. Reason 2 (Top left): Antojito Cantina, Barbacoa lamb in soft tacos, with sour cream, guacamole and pico di gallo. This wasn't easy to eat as the meat was in a fairly wet sauce, but it was really full of flavour, not too spicy, and the toppings really made it. Reason 3 (Top right): So La Ti Dough, Lamb Shoulder slow roasted in the wood fire oven with vine tomatoes, rosemary and garlic. Focaccia baked to order. The lamb was thickly cut and tasty although, I would have preferred a stronger rosemary and garlic flavour coming through coming and it wasn't the easiest to eat with a wooden fork and no knife! The tomatoes were lovely. Reason 4 (Bottom left): Pad BKK, Lamb Massaman curry with jasmine rice, Thai prawn crackers, crispy shallots, peanuts and herbs. The Pad Thai was super delicious, tender lamb with a sweet and spicy sauce, the prawn crackers, spring onions and chilli added a beautiful texture to the dish and the rice soaked up the sauce. This was an outstanding dish. Reason 5 (Bottom right): Scoop Silver Bullet, Braised neck fillet of lamb, ras el hanout, pomegranate and sultana cous cous. We both loved the lamb cooked with Moroccan spices, it was perfectly balanced with tender spicy lamb and a delicious couscous, the slight acidity of the pomegranate was the perfect foil for the meat. It was a close call for first place between the Morrocan flavoured dish and the Pad Thai, both tasted amazing, I think I liked the Pad Thai best and Brian preferred the Morrocan Lamb. I have to point out that, although we had the opportunity to eat whole dish of each to ourselves (or more) we really couldn't have managed it, so apart from the initial tacos, we shared each of the dishes. Reason 6 - There are many different cuts of lamb and your butcher can advise you which to choose. 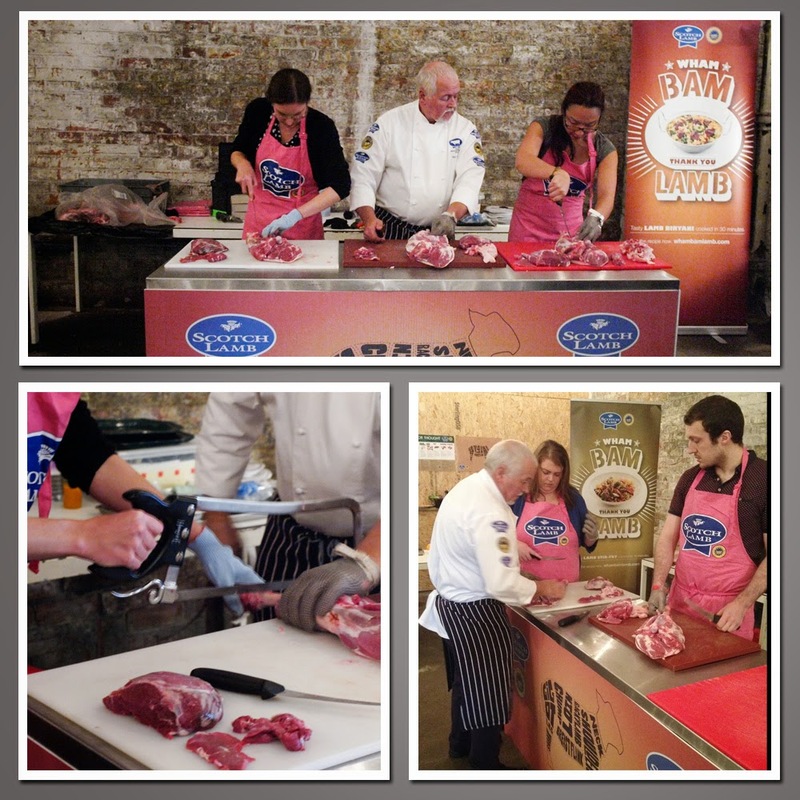 Some of the bloggers at the Street Food Festival took the opportunity for a lesson in butchery. It was a pretty comprehensive lesson which took around an hour and those who took part learned to debone a leg of lamb, muscle by muscle. I would have had a go, but when I saw how much time was involved, I decided just to observe! 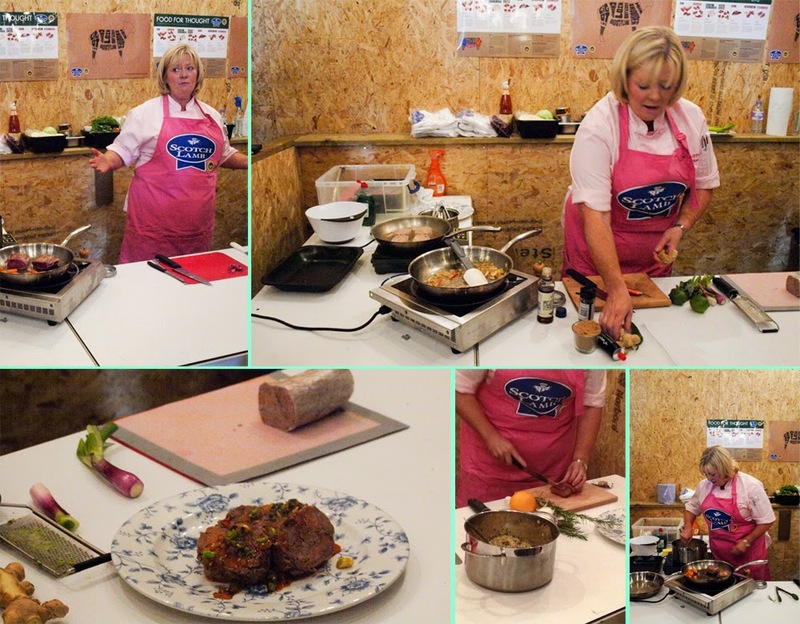 The main attractions for me were the cookery demonstrations by Chef Jacqueline O'Donnell of the Sisters Restaurant. Jacqueline shot to fame last year with her appearance in the Great British Menu when she won the Scottish round but, unfortunately, her dishes didn't make it through to the final dinner. I met Jac at the Highland Show and loved her down to earth attitude and treasure trove of useful hints and tips. I think she should have her own TV series. The Scotch Lamb dishes that Jac cooked this time were lamb loin with caramelised sweet potato served with couscous. We learned about resting the meat to let the temperature equalise right through the meat. Jac also told us some gems about 'keeping the flavour in the pan', for example by cooking the sweet potatoes in a little stock before caramelising them in the pan, then using the stock for the couscous. Even more exciting for me was the rolled shoulder of Scotch Lamb which Jac had slow cooked until it was falling apart, then wrapped tightly in cling film while warm so it cooled in a cylinder shape. Once cold it was then cut into thick slices, pan fried, and served with a Thai inspired sauce which included lime, ginger and fish sauce. The lamb was incredibly tender and the sauce had a lovely balance of sweet, sour and salty. I'll definitely be making this dish. The quality assurance scheme means that only animals from farms that meet the assurance standards are eligible to be classed as Scotch Lamb. Quality Meat Scotland inspect these farms annually and only then can the classification ‘Scotch Lamb’ be awarded to those sheep that have been born and raised on assured Scottish farms. I was a little disappointed that we weren't able to take away the recipes for the demos and the Street Food dishes, I have asked and will share any I make. In the meantime there are plenty of great recipes on the Scotch Beef and Lamb site. Many thanks to all at Scotch Lamb, Quality Meat Scotland and The Street Food Cartel, for a very tasty way to spend a Saturday, eating and learning about Scotch Lamb. It was also great to meet some bloggers I follow online but hadn't met before: Rachel from A Wee Pinch of Sugar, Michelle from Ananyah, Sarah from Glasgow Mummy and the glorious red head, Get Stuffed (sorry I didn't catch your proper name!). 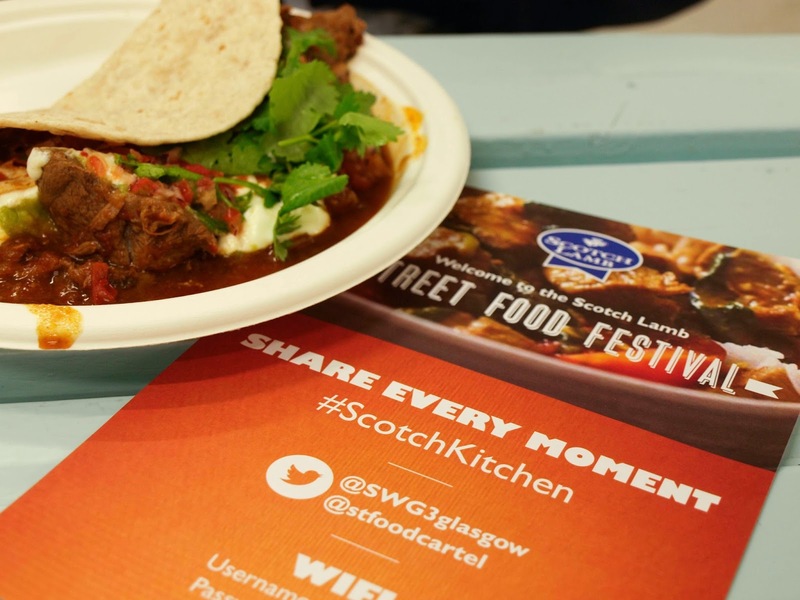 I was invited to the Street Food Festival by Scotch Lamb, I was not paid to write this post and all opinions are my own. Wow, that sounds like one tasty lamb-fest Janice! I love lamb but don't actually eat very much, now very much inspired to get a little more inventive next time I cook any. Moroccan flavours work so well with lamb don't they and I'm very inspired by the Thai twist too!.